Memory Recall: Single Recording 99 Sets. Continuous Recording 99 Sets, Max 3000 Pts. The PHH-830 model has been discontinued. Please see the PHH-SD1 as a possible alternative or contact our Flow Engineering Department. 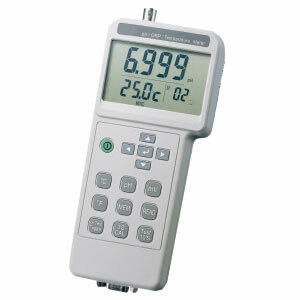 The PHH-830 pH/mV and temperature meter with RS-232 communication is economically priced for many applications. The PHH-830 features an auto data hold. Pressing and holding the “test toggle” key during measurement will cause an “A” to flash and then hold the LCD. The PHH-830 also features recording of 99 records and also has an RS-232 communication for datalogging. Temperature Compensation for pH Range: Manual (MTC): 0 to 100°C (32 to 200°F), adjusting by push ^ button or down button on front panel. Automatic (ATC): 0 to 100°C (32 to 200°F), adjusting with the optional temperature probe. Optional Accessories: pH buffer solutions, pH electrode, temperature probe.